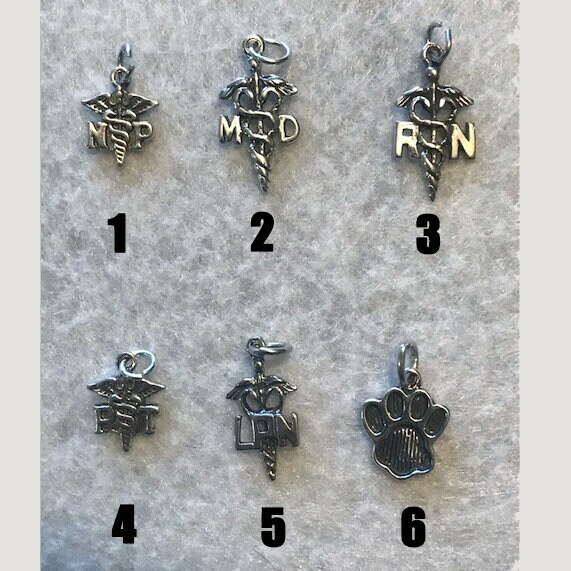 .999 Fine Silver Engraved Adjustable Spiral Twist Stethoscope ID tag with your name, credentials, and choice of .925 sterling silver charm, if you want a different one other than the choices in picture two (like EMT, Veterinarian, etc.) please contact us. 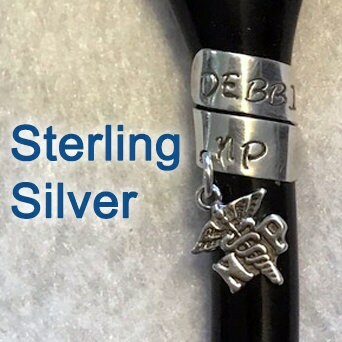 **** Our ID rings are the real thing made with .999 Fine Silver and because of that our letters are darkened with oxidation that will never wash off (we guarantee it!!!!) , unlike the common Aluminum products on the market! Our Stethoscope ID's are easy for you to adjust to your size stethoscope, simply remove the bell, slide on your ID ring and squeeze it tight, them simply replace the bell.